Although Samsung is currently very busy handling the Galaxy Note 7 recall, the South Korean company has quite a few plans set in motion. 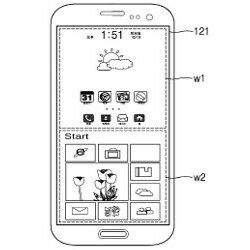 One such plan has taken the form of a patent licensing that might seem strange for Android and Windows Phone fans alike. It looks like Samsung wants to launch a Galaxy smartphone that will be capable to run both the Android and Windows platforms simultaneously. While this isn't the first time the South Korean company is trying to bring to the market such a product, we thought that the patent issues that prevented Samsung from launching the Ativ Q tablet back in 2013 discouraged it to come up with such devices again. However, it appears that Samsung did its homework this time and licensed all the patents the launch of such a device might require, so we will probably see a smartphone version of the Ativ Q tablet in the not so distant future. We're very curious to see how smooth the transition from Windows to Android and vice-versa will be made. In case you don't know anything about Samsung's first try on a dual-OS device, you might want to read out full Ativ Q review published 3 years ago. It's worth noting that the patent that has been made public recently, but it was filed back in May 2015. We can't tell anything about the prototype's hardware configuration, but the sketches show the seamless cohabitation between TouchWiz UX and Metro-style UI that's been improved by Microsoft in the newest version of the OS. From what we can tell, if this smartphone will see the light of day, it will be a complex device where you will be able to assign hardware resources to each OS if you have more demanding operations that Android or Windows must handle on their own. I only know they won't run iOS, forever. Because "Apple". Your name looks weird like PA writer name. What's weird in his name? Don't you know PA have a writer called Cosmin V.? Apple made iOS, they can licence it or keep it to themselves, what's your problem. That's right, the Fandroids like to act as if google providing Android for free is some kind of a charity thing, and not in any way related to them profiting from Adsense of any kind. Google has shown what they really are: they purposely sabotage Windows Phone and refuse to support it, because they know it would jeopardise their monopoly in the "other mobile os" market. It's Alrite. Part of the Quality of Apples devices that they make both the OS and the Hardware. It will always remain as such. We don't care about how great IOS and Apple are. What we do know is they can't and won't ever give us a dual-boot device of any sort. And they don’t make their own hardware, Foxconn and others do that. Samsung are also one of their largest suppliers and Samsung make their own hardware. So get off your iSheep fanboy train and learn a new word called innovation (that's different to Apples copying and claiming they "invented" it). Really? You have facts to back that up? The problem with Windows Phone is the Enterprise no longer standardized on Windows Mobile devices. They all let people bring whatever phone they want to use. Are you actually hoping to sit there and act like it is worth millions of dollars in development time, to make software for a platform use my 2% of the whole world? THIS HAS NEVER BEEN DONE! Blackberry only exists because they support their own useless crap. As widely used as Symbian was, did you see any Google applications running on it? Do you see Google support Tizen? How about I put it to you bluntly. if Microsoft gave a s**t about Windows Mobile in the first place and didn't abandon it for several years, they wouldn't be in this position. How about that?! Google isn't hating on Windows Phone. With all the issues with Windows Phone 7, the fact no one hardly uses it except die-hard losers to lame to switch to better options, the fact Microsoft stripped out of Windows Mobile, every useful thing it was good at; trying to make the device more consumer oriented; which is where they made their mistake and totally abandoning the customers who actually use Windows on the go in the first place. But you want Google to feel sorry for them and support them? You can use many of Google's application via the browser. Google Play Music, Movies, TV, Gmail, Google+ and more all work via HTML. Google Docs also works via the browser too. The fact Google isn't sitting and making a mobile app for those for Windows Phone, is fine by me. I was interested in Windows Phone at first. In fact I bought 2 devices with Windows Phone 7. You all complain talking about Samsung not supporting device with updates. The 2 devices I had never were updated past Windows Phone 7.x. The phones were a piece of crap. The Samsung Focus and the HTC Surround were both garbage half-assed devices. The UI was inconsistent. New skin, but you could see it was just Windows Mobile 6.5 underneath. Good idea, poorly executed, poorly supported and totally useless. Microsoft has now ported its mainstream apps to iOS and Android, so what exactly would be a reason to buy a Windows Phone? I like that MS is offering their options on other platforms. To bad they don't even support their own very well. Now that Enterprise users have not standaradize on WP and never will again, Windows Phone is dead. Even now with MS giving Windows Phone away free, doesn't help it. After all when you have the best, why settle for less. Which is why Windows Phone and iOS both need to just disappear. The only reason IOS exists is because Apple made a smart move and beat Google to the punch. But if Google had beat iOS to the market, Apple would be at the very bottom fighting Microsoft for the leftover scraps and Android prevented iOS from be coming what Android is today... Google not supporting WP is MS's own fault. Get over it already! I know, I remember. But I still want it. Samsung weren't planning on leaving android anytime soon it turns out.. Yet another device paving the way to SmartPhones being practically suitable for Tablet/Laptop/Desktop tasks. Would be great to have Android for Smartphone and Windows automagically presents itself when device is docked in a Tablet/Laptop/Desktop dock. Sammy may set the dual OS, Android and Tizen after this project. I see no need to run both simultaneously. Just set the option to pick one on boot. Or simple "Reboot to Windows" and "Reboot to Android" options on holding down the power button. It looks like Windows is running as an app inside of Android. Sweet! I like the idea. If I can have windows running in a Knox environment capable of being a PC via continuum. (but I will still block windows from as much personal info as possible such as access to my calls, messages, or contacts) You can tell I have no trust in MS privacy, they're like a division of the NSA as far as i'm concerned. Every other touch of the home button bringing you into alternating home screens for each OS would be awesome. Really? So Microsoft, who file a lawsuit against the DOJ and is being supported by Intel, Apple, Google and others; about how the Feds, are requesting your data from them and they are on a gag order, is not enough to show you MS cares about your privacy? Gosh, when idiot pills were handed out, so many people here much have taken a truckload of them home for mass consumption. The fact is, once ANY company has your data, no matter what their agreement says, you have no idea what they will do with it. And you know this for a fact? How much ram you think apps on mobile need? We are talking apps with only thousands of lines of code, NOT millions. The vast majority of apps on your phone, don't even use 256MB of RAM. Wake up and grow up! I don't know but I can feel the lag. Hoping that it won't.